HorseDream Canada Leadership Camp is an unforgettable experience. Campers will participate in a week of horse-filled adventure, self-discovery, and friendship-making! We can assure you that your child will have a great time at our camp, and that they will be supervised by quality staff in a healthy and safe environment. This page contains information for discerning parents and campers about our facilities, staff qualifications and supervision, as well as how we ensure the health and safety of your child. Don't forget to check out our photo gallery below! HorseDream Canada Leadership camps are held on location at Wilson H2 Ranch near Woodville, Ontario. HorseDream Canada is nestled in the charming countryside of the Kawartha Lakes on a 50-acre equine facility. for 2015, we are constructing new cabins that will be used for sleeping, rest times, and indoor activities. Each camper will have their own bed and a space for their personal belongings. Please have your camper bring along with them a sleeping bag and pillow. Read more about our location here. 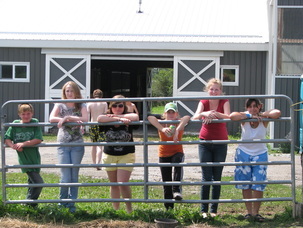 At HorseDream Canada Leadership Camp we promote a healthy and physically active lifestyle. All meals are prepared by our in-house chef to be well-balanced, nutritious, and delicious. Campers will receive a hot breakfast, box lunch, and delicious dinners each day, along with snacks throughout the day. If you have an allergy or dietary restriction, let us know and we will accommodate you! Many campers have said one of the highlights of their time with us, is the food! All staff are hired based on a strong background in working with youth and specializations in camp-related activities, such as leadership, arts and crafts, cowboy skills, and swimming. We hire an experienced and certified horseback riding lesson provider to ensure that campers learn fundamental riding and horsemanship skills. Susan Wilson, the proprietor of HorseDream Canada, will spend time daily with your child working with them in groups and individually on their leadership development. 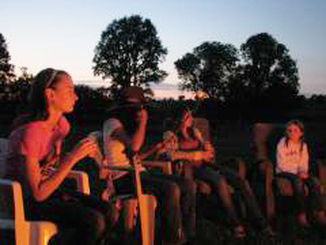 Staff are trained in conflict resolution, leadership, camper inclusion techniques,and health and safety policies prior to camp. We require all staff to provide us with a clear police check prior to beginning work at Camp. HorseDream Canada Leadership has a health and safety policy to ensure the well-being of your child. With a staff/camper ratio of 1:4, staff are always on hand to prevent or respond to any accidents. First aid kits are fully stocked and our staff are trained in how to respond to accidents that takes care of both the child affected, and all others present at camp.